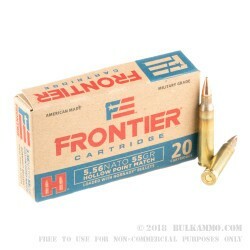 If you're ready to see your AR-15 at its peak performance, you need to load it with some of this 5.56x45 ammo by Hornady Frontier. These match rounds are built to be fast and powerful to give you the upper hand in competition. 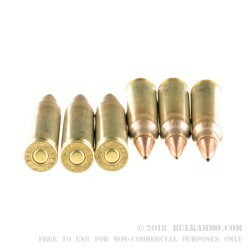 Each cartridge is paired with a 55gr hollow point Match projectile that sits atop a brand-new brass casing. The 55gr HP Match exits the muzzle at an impressive 3240 fps. These casings are Boxer-primed and reloadable. If you're concerned about ordering such a large quantity of match ammo, don't be; these cartridges are non-corrosive and can withstand a long period in dry storage. 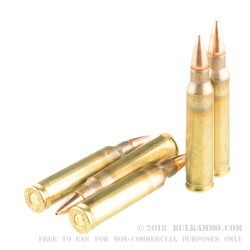 Crafted using Lake City brass and assembled in the Lake City Army Ammunition plant, these rounds are military-grade and available at an unbelievable price. This 500 round case is an economical way to try Hornady's latest and greatest 5.56x45mm ammo, so order yours today! Q: Do these come as a bulk box or individual boxes of 20 each? A: This offering is packaged in 25 boxes of 20 cartridges.